An inaugural free one-day festival of Australian South Sea Islander film, arts, food and music will be held at BEMAC in Brisbane on Sunday 14 December 2014. The event is the culmination of a 12-month project, funded by the Australian Council for the Arts. It has seen participants from Brisbane, the Gold Coast, Rockhampton and Hervey Bay learn new skills and produce seven short films. Last year marked 150 years since boats carrying 60,000 South Sea Islanders started to arrive in Queensland. The descendants of these people, who worked as pastoralists to build the cotton and sugar cane industry in Queensland and NSW, have come together this year to tell their stories. 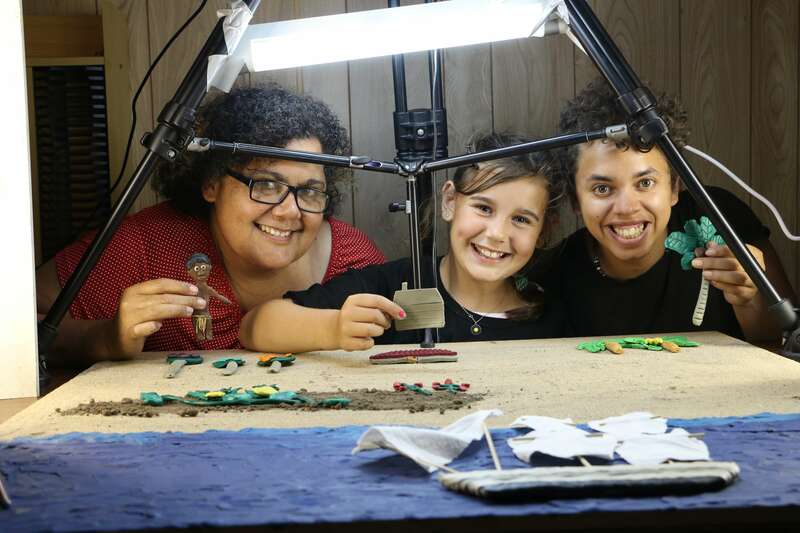 The film premieres include a charming stop-motion animation by 10-year-old Jessika Bezgovsek from Brisbane’s North Lakes that tells the story of a respected community elder. The narrative, told by Aunty Valda Coolwell, focuses on her grandfather, who was ‘blackbirded’ (coerced through trickery and /or kidnapping to work as a labourer) from Vanuatu and went on to build a life in Queensland. Another documentary by Danita Martin – shot on Stradbroke Island – features singer / songwriter Georgia Corowa, who has worked, performed and toured nationally with some of Australia’s finest musicians. A married couple from Rockhampton have also chosen to make their own films. Joanne Warkill, whose parents Joe and Monica Leo featured in the 1995 documentary Sugar Slaves, is making her first film about the inaugural 2013 Australian South Sea Islander Gala Ball. Her husband Kerry Warkill has dedicated his own very personal film to their children. Other films have been shot on location on the central and Sunshine Coasts, telling stories of large families and places of historical significance. The majority of participants are first time filmmakers who have learned everything from scriptwriting and story boarding through to camera operation and editing using professional equipment in the last year. Melbourne-based Australian Solomon Islander filmmaker and creative producer Amie Batalibasi, who facilitated the workshops, is running the project in partnership with the Australian South Sea Islanders Secretariat Inc. Brisbane (ASSIS Inc.). Ms Batalibasi has been involved in many community film and media projects – including Pacific Stories, Wantok Stori and the Young Media Makers Project – said she felt privileged to be working with ASSIS Inc. as Creative Producer. “During the 150 Commemoration events last year, I volunteered with ASSIS Inc. to help run some community screenings showing films about Australian South Sea Islanders. It was surprising to see how little video content there is, that has been made by ASSI communities themselves. I hope that the ASSI Stories project, will be a first step towards changing that,” Ms Batalibasi said. President of ASSIS inc., Edwina Lingwoodock, said the project aimed to help ASSI people tell their stories to the wider community about who they are and how they have contributed significantly to the development of modern Australia. “This project will be empowering to the ASSI community by giving a voice to Australian South Sea Islanders. The videos and media produced from the project will stand as long-lasting educational resources in the future,” Ms Lingwoodock said. After the premiere, ASSIS Inc. will establish a website to showcase the films and produce an online education kit that will be accessible to all.